As a child, Julie wasn’t known for being what you’d call a cooperative backpacker. She’ll be the first to tell the story of how her parents would “take shifts” walking with her. One parent would zip off ahead to enjoy the peaceful walk amongst nature as one does, while the other would hang back and listen to Julie complain about how her backpack was too heavy (due to being full of books) and that she couldn't read and walk at the same time. Needless to say there wasn't any apparent future in backpacking for Julie. Fast forward 30 years and throw in a mix of growth, appreciation for the outdoors, and a passion for food, we find ourselves at Julie’s first backpacking trip since childhood. She’d done a bit of hiking at this point and decided to take the plunge into overnight solo trips with her dog Lola. Feeling a mix of excitement and empowerment, she gathered or borrowed what gear she needed, grabbed whatever backpacking food was available off the shelf at the local hiking shop and hit the trail. Everything went smoothly, barring the exhausted dog who is not as adventurous a pup as she might think. After setting up camp at the beautiful and calm Moraine lake sitting at treeline just below South Sister (a 9,000 foot snow capped volcano in a series of other mountains), Julie was in awe. As someone who had grown up in a foodie family, married into a foodie family, and spent their whole life cooking food as the best way to bring friends and family together - Julie believed that the food you eat should be an important part of any experience. When she got to cooking the meal she had grabbed on her way out of town, she was sorely disappointed by her first bite of food. The homogeneous glop-like texture and bland flavor profile didn’t come close to matching the beautiful environment she had earned. You would think that Henry, having been raised in Bend, grew up outside. Unfortunately his parents didn’t take advantage of the amazing trails and outdoor activities for many years, and consequently, didn’t place enough importance on the outdoors. But nature has a way of calling to people, and Henry, despite his parent’s negligence, now hears that call. In fact, Henry has been driven to be outside for several years now. 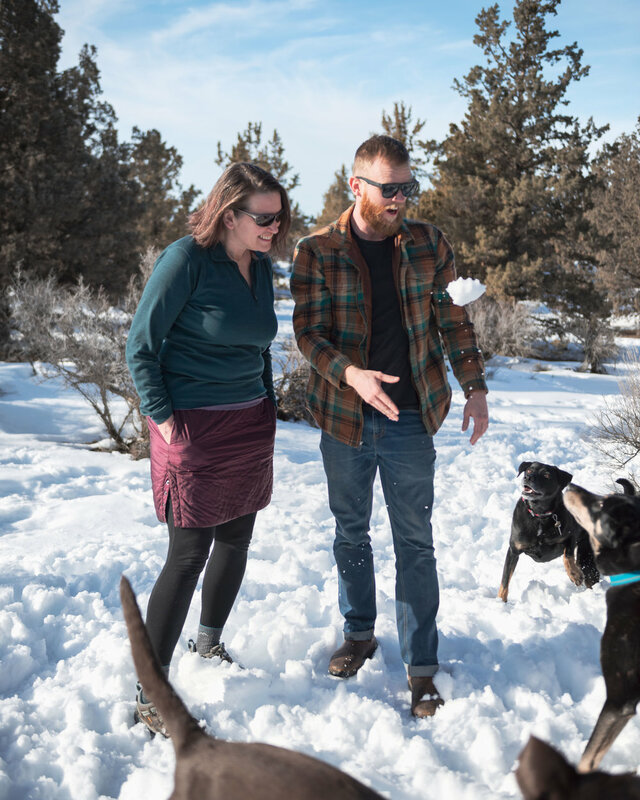 He takes full advantage of what Central Oregon has to offer, be it mountain biking the local trails, ice-climbing Paulina Falls, backcountry skiing up Tumalo Mountain at dawn, or just hanging with his mom for a day of hiking and paddling. There’s always something to do outside and Henry’s always up for it. Henry’s love of the outdoors has translated into several passions and that, along with a love of photography means that his camera accompanies him on many of his adventures. It was that love in fact that provided the seed of inspiration for Food for the Sole. In 2015 Henry and his buddy Mark decided to hike the John Muir Trail, planning a landscape photography tour that would result in dozens of remarkable photos, but also prompted Henry to ask his mom to provide their meals for the trip. The meals Julie created were an instant hit, far exceeding the expectations that Henry and Mark had. Julie was able to provide well-rounded nutrition with a focus on caloric density, high levels of protein, and fresh vegetables. The food was unlike anything the Henry had tasted, which led to several years of encouraging his mother as she developed recipes and pondered the idea of creating a business. Along the way, Henry provided support, and endless field testing, giving Julie the courage to take the next steps toward launching Food for The Sole. Now that business has come to fruition, with Julie and Henry as business partners, making great tasting backpacking meals for everyone to enjoy. See the meals in question here!